84" Portable Projection Screen is compact and travel-friendly option for small meetings, mobile presentations or home theater. This unique projector screen allows you to set up quickly and easily on any wall or floor stand. This Type Screen is the ultimate screen for mobile professionals. When you're ready to present,this screen allows you to set up quickly and easily on any wall in minutes. 【Portable & Lightweight】Made of 100% Matte White PVC. 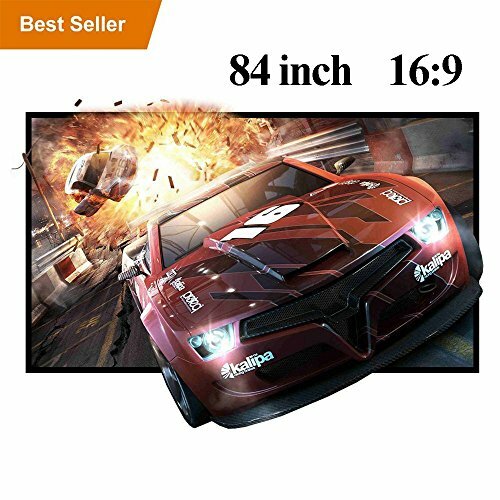 Specification: widescreen 84 inch, 16:9 screen format, screen size: 186 x 105cm/ 73.22 x 41.33 inch. The projector screen is lightweight, anti-wrinkle, foldable and easy to carry around. Screen will not turn yellow for long term use.